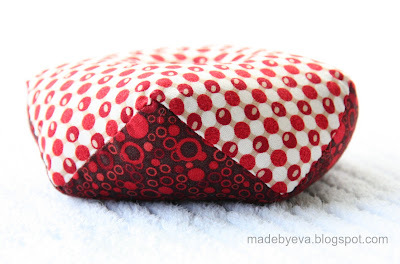 I first saw this kind of pincushion on the blog Bridges on the Body and was absolutely fascinated by this fairly complex shape that was created by just two square pieces of fabric. How could that be? On a side note: Yes, there are women out there who make corsets, in this day and age. And yes, there are other women who read their blogs with great interest. Yours truly included. ;) Take a look at Bridges on the Body and prepare to be amazed! This particular shape is called a biscornu, meaning "irregular, quirky, complicated, bizarre". And quirky it is... 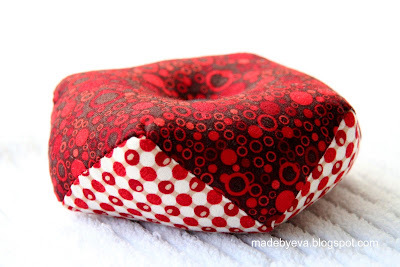 Originally, they were made with linen or other embroidered fabrics, but I decided to go a bit more modern and used two pieces of fabric from the Sunset range by Paintbrush Studio. The trick to this pincushion is that the two squares are sewn together, not directly on top of each other as usual, but with a relative 45 degrees rotation. That's it! Sounds easy enough, right? First, mark the middle point of each side, on the wrong side of both squares of fabric. You can just about make out my lines on the light fabric in my picture. 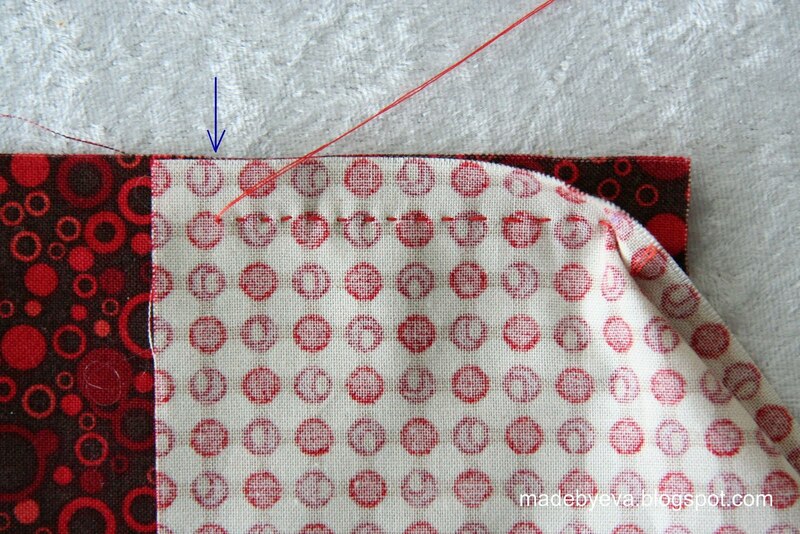 Layer them, right sides together, in the following manner: The middle point of the light fabric should line up, not with the edge of the of the dark fabric, but a little bit to the side of it (refer to picture). 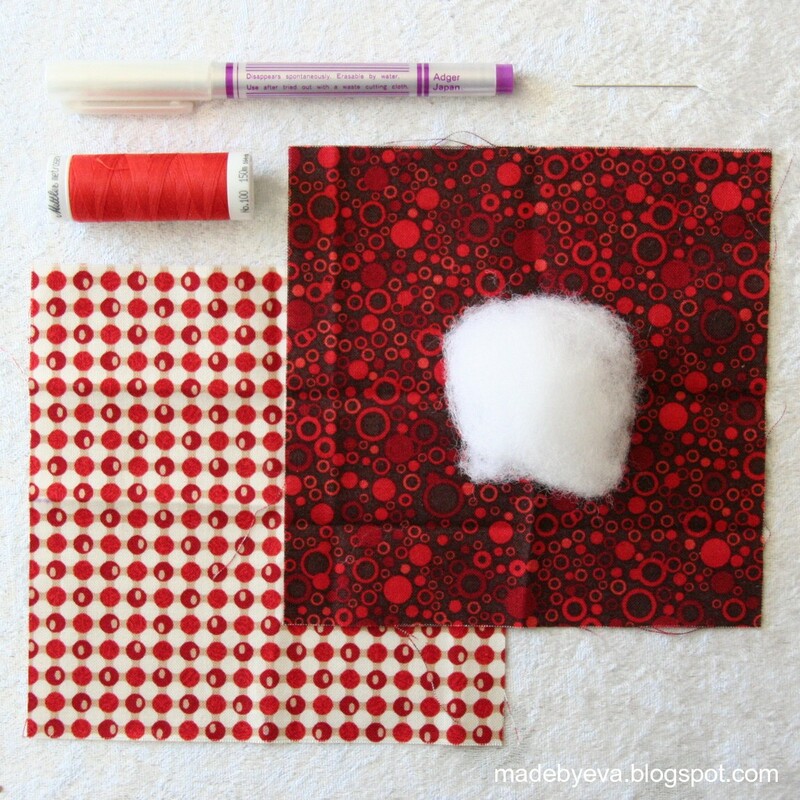 This little distance is your seam allowance! 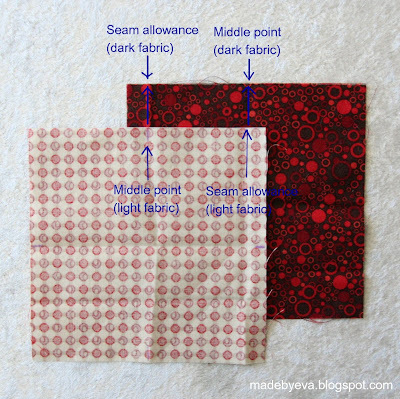 You'll see that the middle point of your dark fabric matches up with the seam allowance distance on your light fabric in the same way (refer to picture). 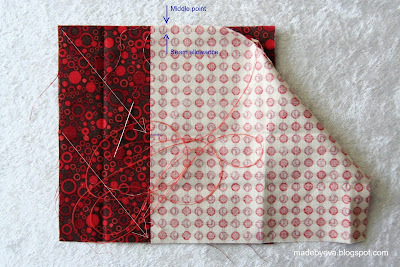 This is what it should look like before you start your first seam! For the very first seam, start just right of the middle point of the light fabric, and sew to the middle point (right arrow). This means that you are stopping the correct distance from the edge of the dark fabric (left arrow). 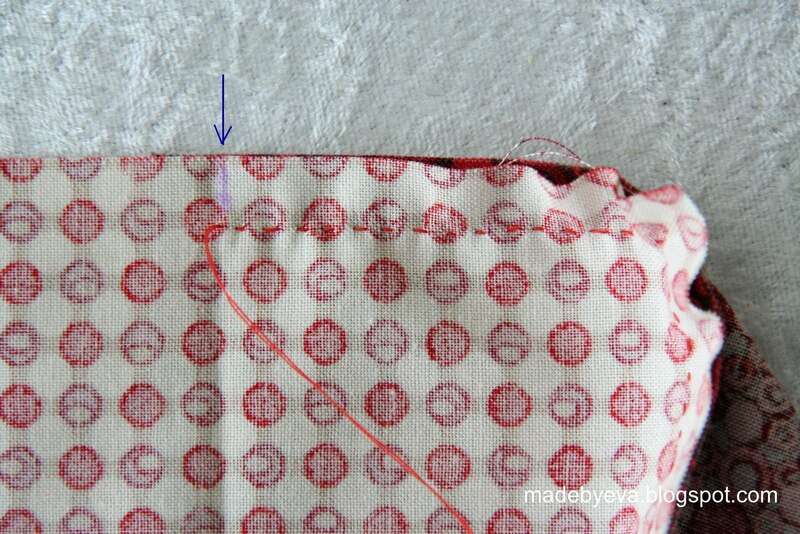 The reason for making just this little seam to start with is to secure the first corner of the biscornu while leaving a gap in the side for turning inside out and stuffing. Then comes the tricky part. 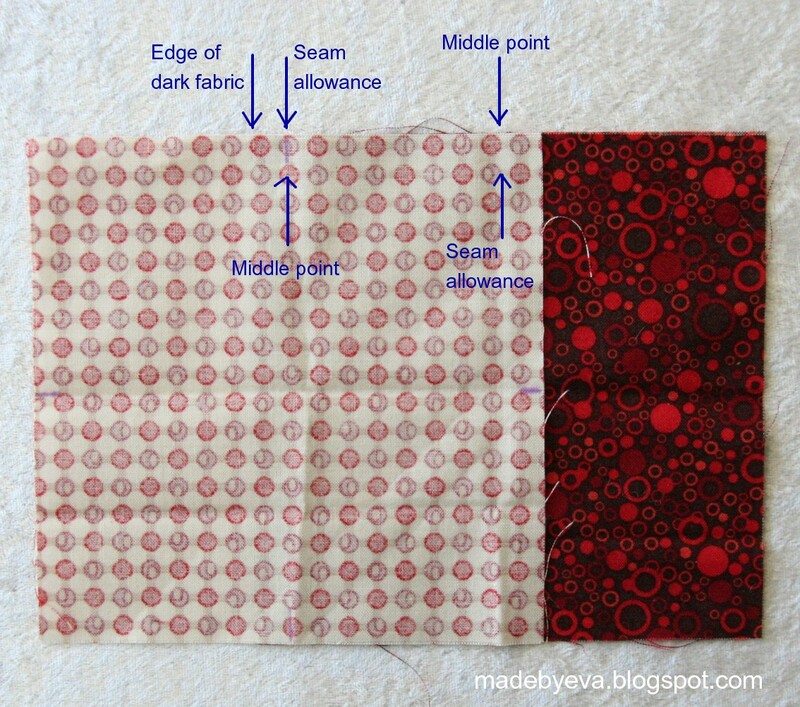 To keep sewing along the light fabric without going past the edge of the dark fabric means that you'll have to turn the fabric 90 degrees and align the last half of the light edge to the first half of the next dark edge. Not making any sense, am I? ;) It makes a lot more sense when you're sitting there, trust me. There's really only one way to turn in order to continue. 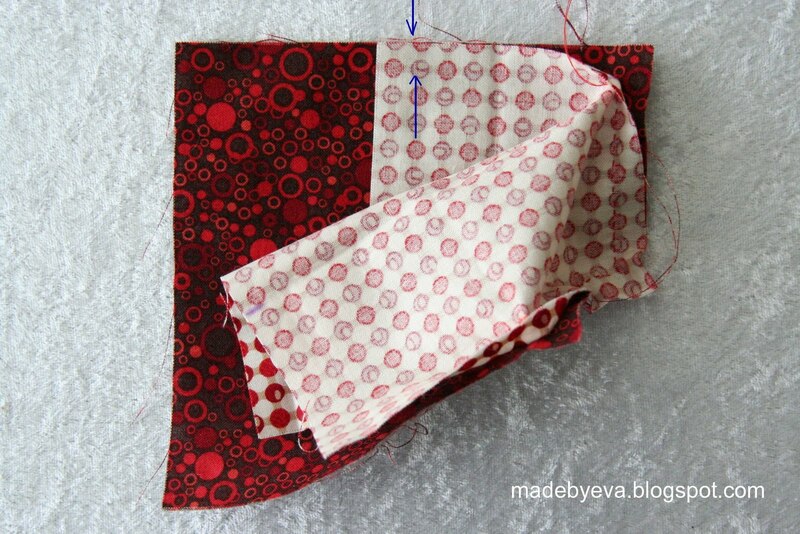 I've added two white arrows in the picture to try to clarify it: each corner meets the side of the opposite fabric. Corner meets middle, middle meets corner and so it goes. 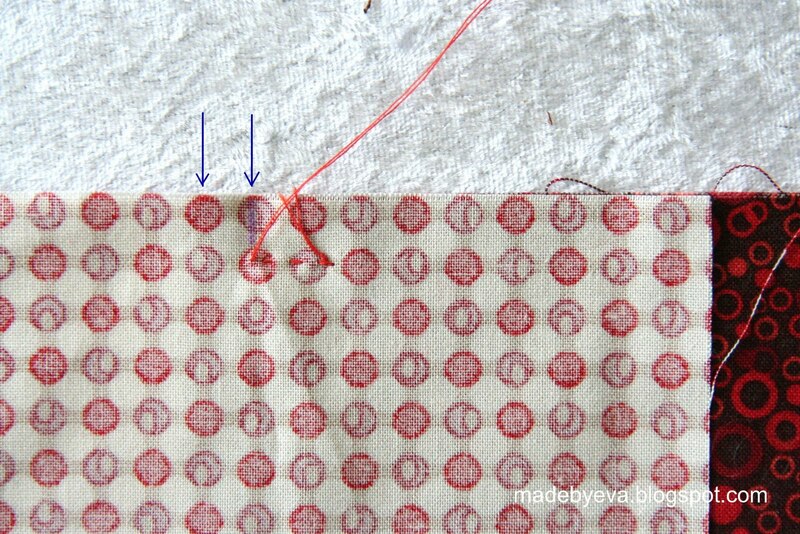 So, continue to sew along the side until you reach the middle point of the dark fabric (arrow), that means you should stop just short of reaching the edge of the light fabric (refer to picture). 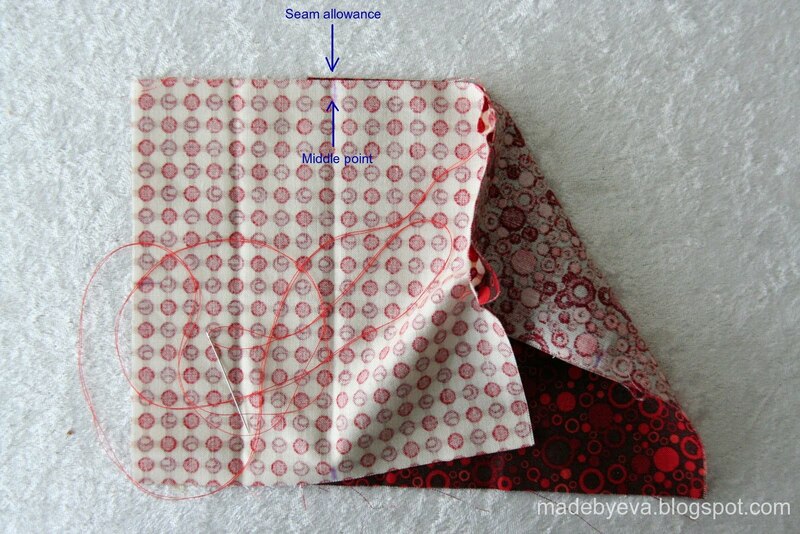 Again, this is your seam allowance at work. Turn 90 degrees again, and line up the middle point of the light fabric to the seam allowance point of the dark fabric. Is it starting to make more sense? Sew until you meet the middle point of the light fabric. Do you see? 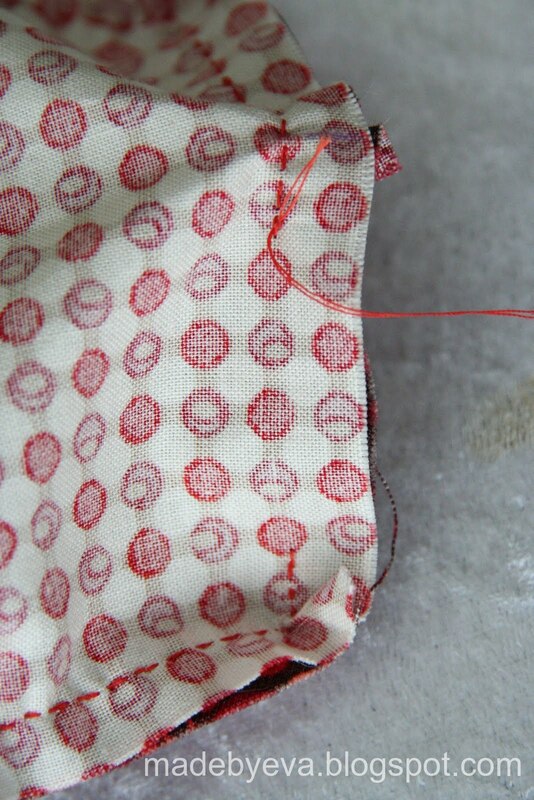 On the last seam you stopped at the middle point of the dark fabric and near the edge of the light one - now it's the opposite. OK, now it's getting funky. All this turning is making the fabrics fold and curl in surprising ways and it's not always easy to align the fabrics. Go on, you can do it! 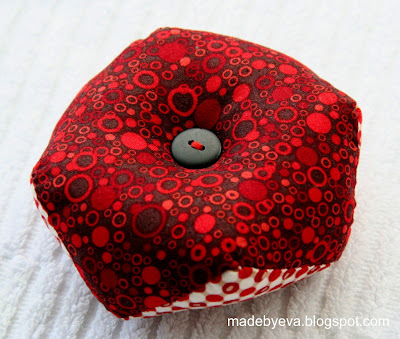 Just keep sewing and turning, and the shape of the finished pincushion will start to reveal itself. 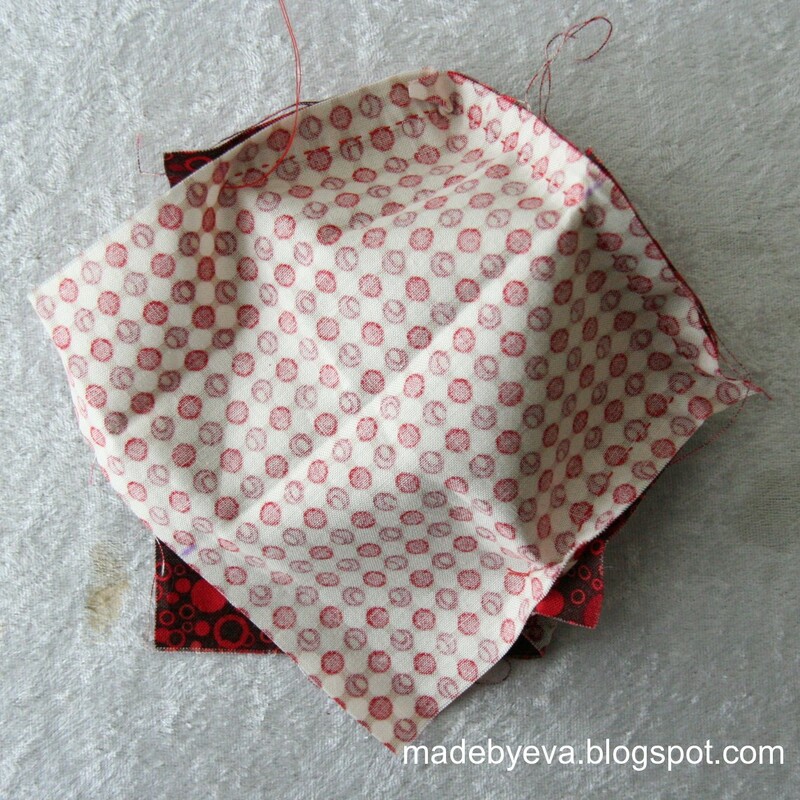 When you turn the last corner, don't sew all the way over to your starting point. You'll want to keep an opening for turning your pincushion the right way out and stuffing it, while still securing that last corner with a few stitches. I went back over my original seam once more at this point to strengthen it. Look at that! Turned the right way out and stuffed, we're nearly done! See how both corners next to the opening are sewn and secured, so all that remains is to close the opening in a straight line using a ladder stitch. 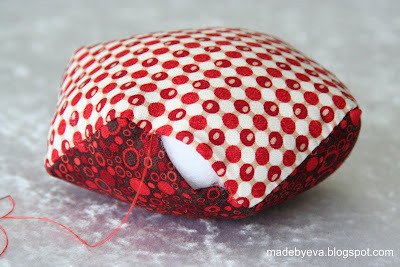 I learned a little trick a while back - don't use big wads of stuffing, it distributes unevenly and creates lumps. Instead, tear little tufts of stuffing and put in a little at a time. I've stuffed mine quite full, but make sure not to overstuff it, because you want your buttons to be able to make that signature "dent" in the middle. 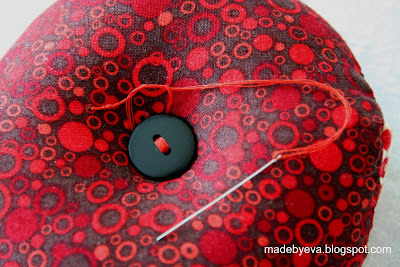 So for the buttons: I just tied four strands of thread to the black button, pushed the needle through to the other side, went through the white button and back down to the other side again. Tighten the thread and bring the thread between the two buttons a few more times. 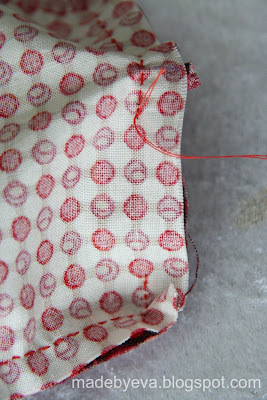 To secure the thread I simply tied the two ends together under the button using a few tailor's knots, and squirted a drop of glue on the knot for good measure. Looking at this makes me think of those mind-bender pieces of art where you can't tell what's the top and what's the bottom. 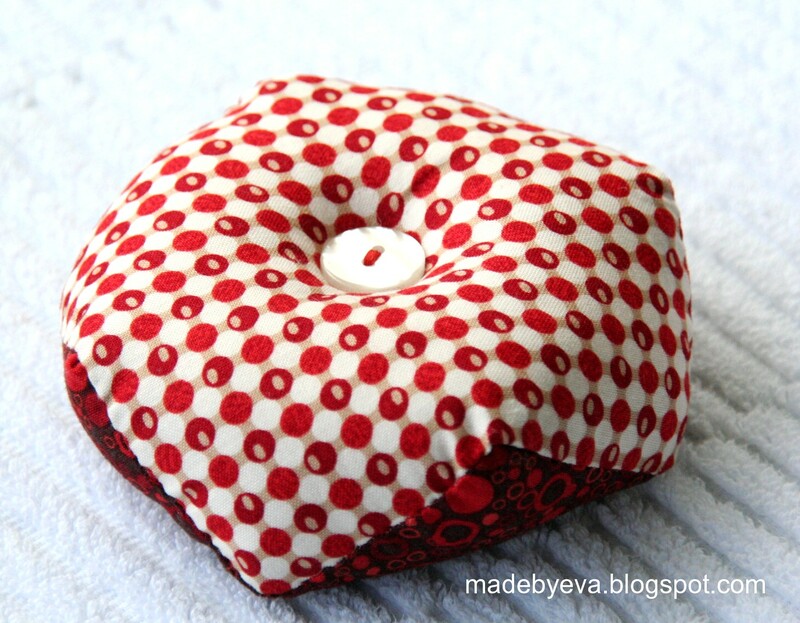 Uber cool! Thanks for sharing ... I'll be linking. Will need to try this.